Rock climbing has its own culture. The thrill-seeking activity is now gaining popularity. It was first developed as a survival skill in difficult terrains and although people lose their lives to the sport every year, it continues to draw people in. Alberta is home to some of the world’s most epic mountains. The Rocky Mountains’ beauty often go under-appreciated when you see them every day in Calgary’s skyline. There are so many activities to take advantage of on the ridges to gain a better appreciation of how truly spectacular the mountains are. Some are choosing more extreme activities like rock climbing. The thrill seeking activity is a relatively modern sport, but the practice has existed since the day ancient man discovered the rock. Rock climbing was first developed as a survival skill in difficult terrains. It’s now a popular past time and even an extreme sport, drawing in thrill seekers and dare devils to compete. People lose their lives to rock climbing every year. What draws people back for more? Tyler Klinkhammer, a third year journalism student at Mount Royal University, says climbing is just another form of puzzle solving. He says that as the climbing “puzzles” get more challenging the sport becomes more rewarding. “[Climbing] gives me a great sense of accomplishment, which is invaluable to me because it staves off depression and makes me feel like I’m good at something,” says Kinkhammer. Rock climbing isn’t all about the thrill and pushing yourself to that next step, the sport also has many health benefits. Brody Sykes, a recent graduate at the Southern Alberta Institute of Technology has been rock climbing both indoors and outdoors for years. He says climbing is very physically demanding. It targets muscles in the arms, chest, back and legs, without ever having to step in to the gym. “The full body workout while doing something fun as hell is what I enjoy most. Also, the climbing community is pretty much the friendliest and most helpful around,” says Sykes. Ascending walls not only gets your heart pounding, it is also a great form of cardio. A one hour climbing session can burn well over 700 calories while reducing stress levels and increasing norepinephrine — a chemical that helps our brains balance our response to stress. Luckily, you don’t have to be a seasoned expert to enjoy rock climbing. Start slow, and get some grime under your fingernails. The rush of seeing things from a bird’s eye view is just a few steps away. Here are some ways you can get started. There is no point in rock climbing if you are not going to enjoy it. Get out there and try it. Take some time to swing around on the ropes and ascend down the wall. Rock climbing has the power to bring you back to your childhood. Numerous health and fitness clubs have designed indoor rock climbing walls for those who aren’t ready for the mountain air or might not have time to make it outdoors. Make sure you have the proper equipment and double check it. Climbing a rock is dangerous whether it’s indoor or outdoor. Even the pros make mistakes, so make sure you are always checking over your knots and anchors. Whether you enjoy the fresh air, getting in-shape or tackling a new challenge learn to love rock climbing and you won’t be disappointed. 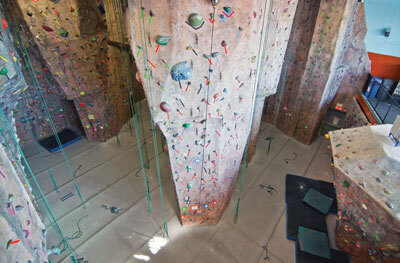 MRU offers a variety of rock climbing training sessions and practice times. The university’s wall offers both free style and tethered experiences. For more information visit mtroyal.ca’s rock climbing page. For more information about Rocky Mountain climbing check out rockclimbing.com. Previous story How would you rank Calgary’s sporting facilities?